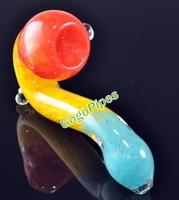 Multicolor SM Sherlock glass pipes are about 5 inch long. Pros: Perfect size, beautiful colors, heavy glass and sits nicely. Have not used it yet but looks fine to me. Pros: Everyone loves this pipe. Hits hard and can pack it deep . Pros: Great coloration and shape, feels good in the hand, and a nice sized bowl. holes aren't too large or small, and very thick. Cons: Its soft glass (not borosilicate)and the marbles need to stand the piece at a less top-heavy angle. Comments: Overall, great buy for the price! Will continue to buy from gogo for as long as they have such great prices! Pros: Solid, heavy for the size, great colors and lightly fumed. Cons: They could of put 2 marbles on it to keep it up right on the table. Can be tricky to sit it up.